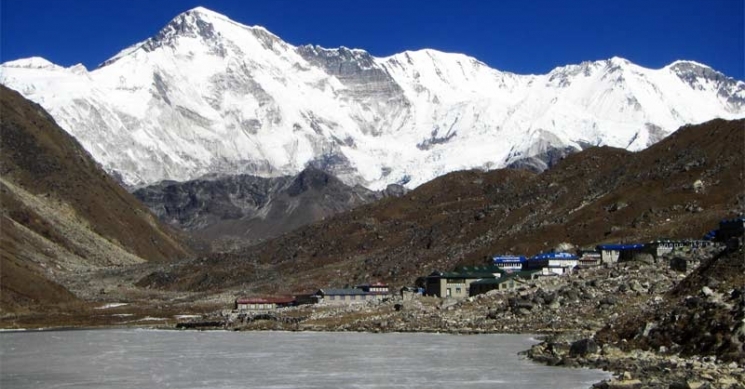 Gokyo Valley Circuit Trekking is famous trekking in Everest Region. 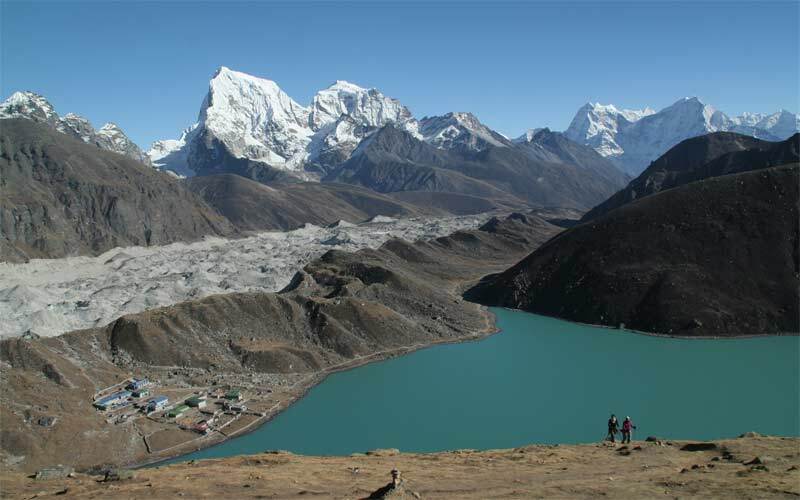 While views of Everest from Gokyo peak is the main attraction of the trek, turquoise lakes, glaciers, Sherpa villages, viewpoints, monasteries and the like make every moment interesting. 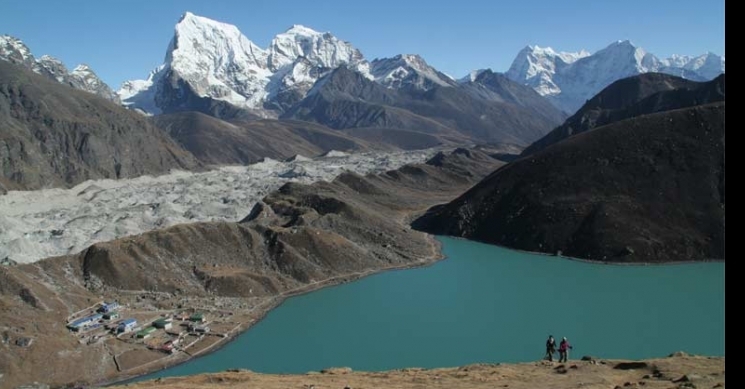 Gokyo Valley CircuitTrekking is renowned among travelers for outstanding views of Everest that it offers at the Gokyo peak which is comparatively better than at Kalapathar. 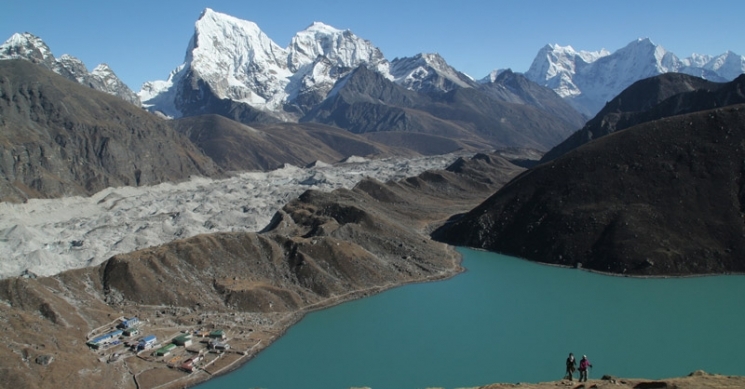 The route passes turquoise lakes, monasteries at high altitude, several viewpoints with panoramic mountain views, Sherpa villages and rare flora and fauna. 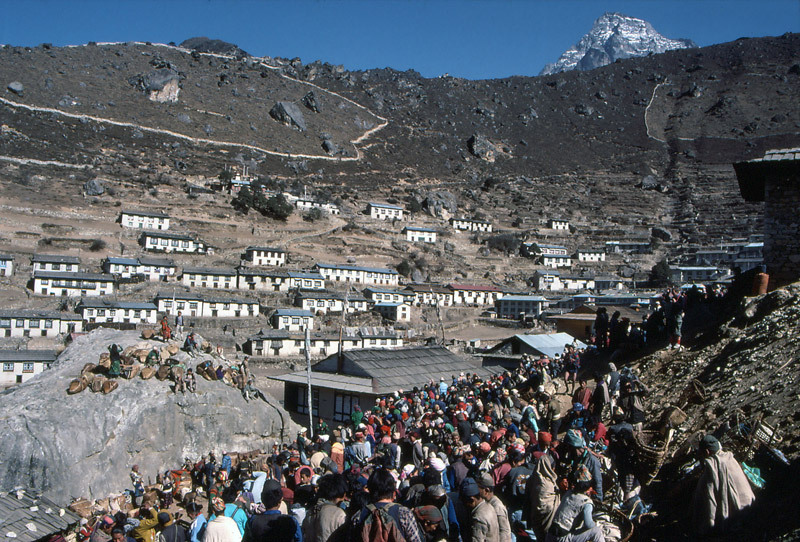 The Gokyo Valley Circuittrek begins with a 40 minutes flight to Lukla in the early morning. Breathtaking views of the snow peaks keeps us company during the flight. We move to Phakding which is a short hike from Lukla. 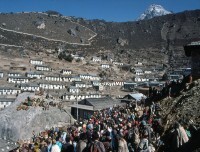 The next day, we head to Namche Bazaar, the gate way to Mount Everest. We spend another day here for acclimatization, and meanwhile, also get an insight into Sherpa culture and lifestyle. 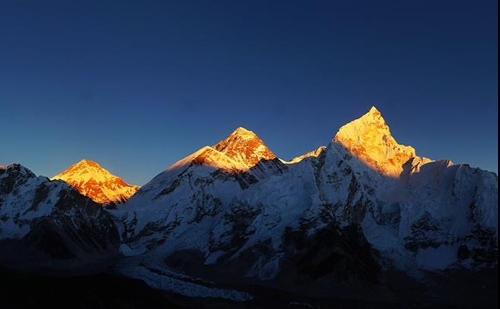 Beautiful morning views of Mount Everest, Ama Dablam, Lhotse, Khantenga, Thamserku et cetera await us here to inspire us in our journey ahead. 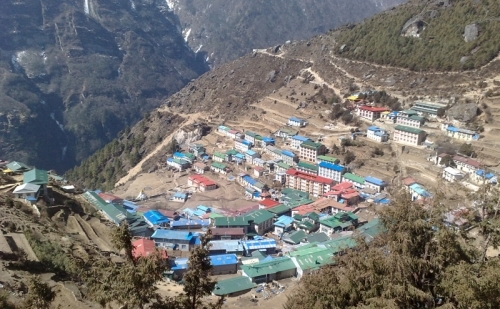 We then move to Dole, a farming village five hours walk from Namche. The next day, we move to Machhermo and pass worlds second largest glacier Ngozumpa. From Machhermo, we move on to Gokyo, where the highlight of the trek, Gokyo village awaits us. 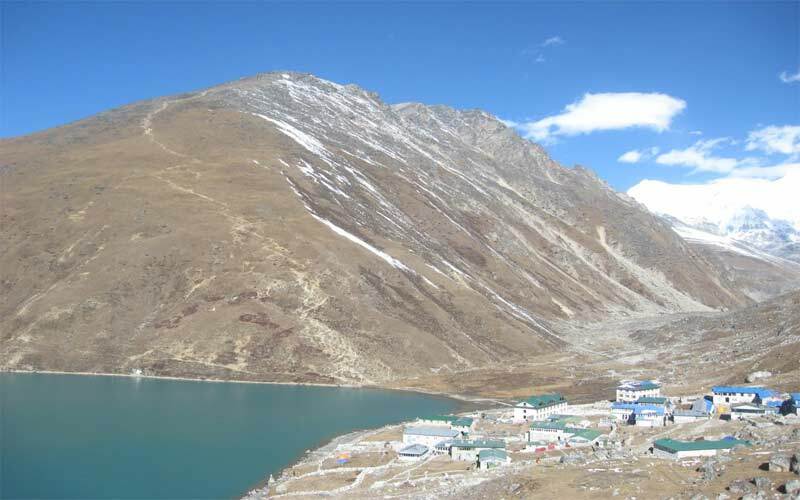 We stop here for acclimatization and take a morning stroll to Gokyo Ri to relish on the wonderful views of the Everest Region. We then move up to Machhermo and drop to Phortse that lies just under the peaks of Tawoche and Cholaste. The Tyangboche monastery at Tyangboche an important Buddhish monastery, the largest in Khumbu region. Our journey back to Lukla is through the small village of Jorsale. From Lukla, we take a flight back to Kathmandu to complete the journey. Rescue Arrangements off course not the rescue bills ! Tips for Guide and Porter ( it is expected). Day 1 :Arriving In Kathmandu (1250m)Arrival in Kathmandu. Our Airport Representative will meet you at the Tribhuwan International Airport. A drop to the Hotel by private tourist vehicle is arranged. You can either take a rest or meet us at our office and know the detail arrangement of the Trek. Overnight stay at the hotel. Day 2 :Fly to Lukla at 2840m and trek to Phakding at 2610m (3 hours)The early flight to Lukla from Kathmandu airport after breakfast is thirty minutes of breathtaking mountain views. From the Tenzing-Hillary Airport, we move on to meet the rest of the crew and make arrangements and final preparations. 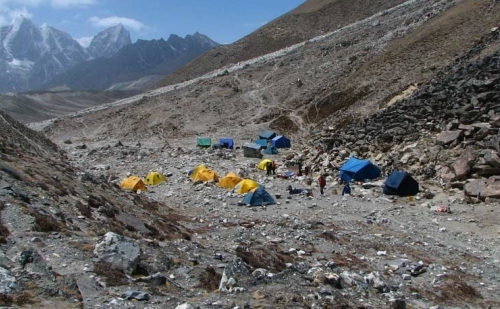 The hike to Phakding takes around three hours and passes the Chaurikharka village to follows the Dudhkoshi River, a short one to assist acclimatization. Overnight stay in a lodge. Day 3 :Trek to Namche bazar - 3440m (3 hr)Today’s walk starts along pine forests and pasture lands with several suspension bridges to cross at various points of the Dudh Koshi River. Upon reaching the confluence of Dudh Koshi and Bhote Koshi, the climb becomes steeper. After walking for about two hours, we reach a viewpoint giving the first sight of Mount Everest. After passing Jorsale, we reach Namche Bazaar, the gateway to Everest and a trading center as well where we take rest for the day. Day 4 :Rest at Namche for acclimatizationNamche Bazaar, the biggest settlement in the Khumbu region, is well facilitated with ATMs, Internet cafes, restaurants, bakeries et cetera. 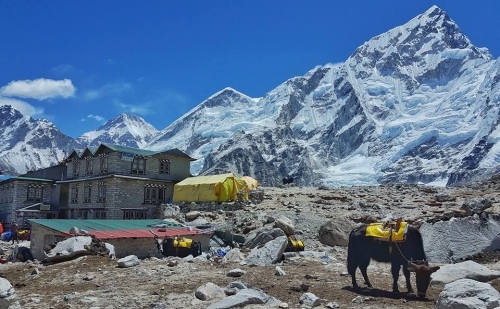 Although it’s rest day for acclimatization, we go for a short hike to a nearby viewpoint (Thame or Khunde) and take a tour of the place including the Tourist Visitor Center where information about Everest climbers, Sherpa people and their culture and flora and fauna of the region are briefed. 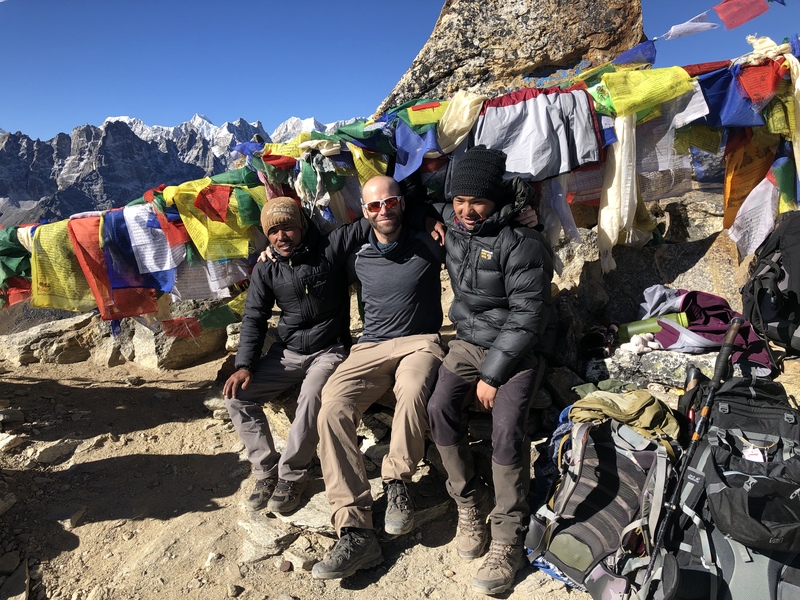 Day 5 :Trek to Dole - 4200m. 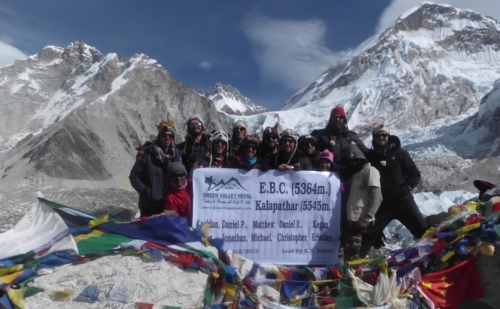 (5-6 hours)We start our walk early in the morning to get clear views of mountain ranges including Everest, Lhotse, Ama Dablam and Thamserku. The trail takes a wavy path along which the pleasing vegetation and animals such as musk deer, Himalayan Thar, pheasant et cetera keep company. Passing Kayangjuma after a downhill, we reach the junction to EBC and Gokyo valley. From here, we climb to Mong La pass where the sacred Khumbila is a charming presence. Passing Mong La, Rhododendron forests and wild flowers get abundant, and so does animal life. Passing a few waterfalls and bridges, we reach the small village of Dole. Overnight stay. Day 6 :Trek to Machhermo - 4470m (6 hours)After climbing a ridge, the trail moves through Lhabarma and to Luza where we pass summer settlements of the locals. 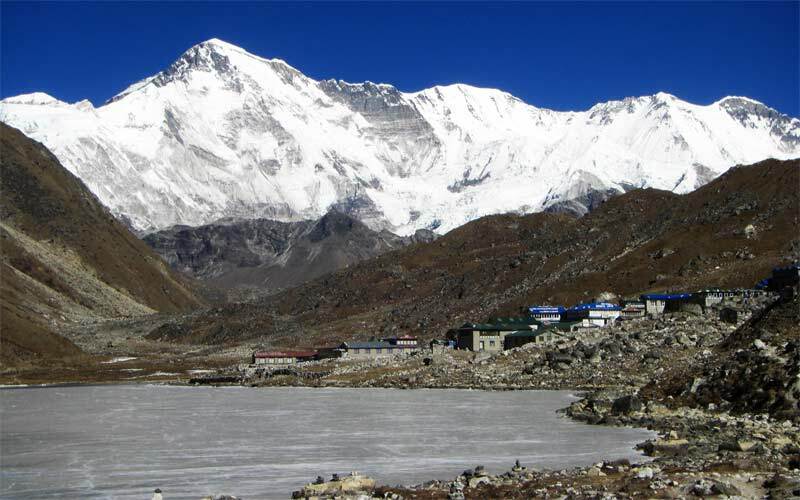 Views of Kantega, Cho Oyu and Thamserku stay with us as we walk along the trail. Passing small villages on the way, the scenic hillside walk leads continues with views of the deep Dudh Koshi valley. The five hour walk ends at Machhermo, our stop for the day. A beautiful stream that originates from Kyajo Ri and Phari Lapche runs through this village where you can hear stories on the first sighting of Yeti. 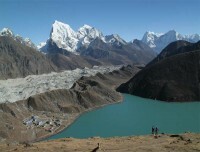 Day 7 :Trek to Gokyo - 4790m. 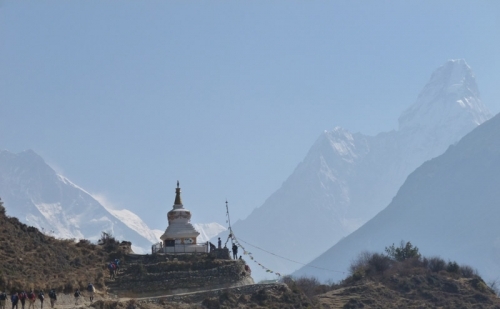 (4 to 5 hours)From Machhermo, the trail ascends to a Chorten through a ridge where views of Thamserku, Kangtega and Cho-Oyu along with the valleys below are magnificent. The valley slowly widens as the easy trail passes another Chorten and reaches Pangka. 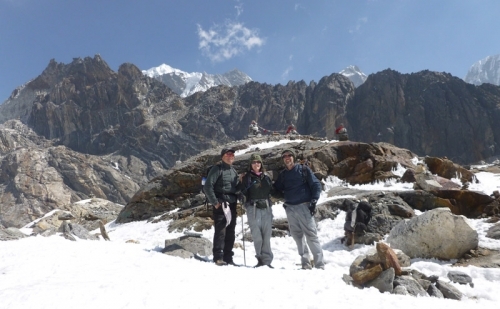 Descending to the river bank, we then begin our steep climb to moraine of Ngozamba Glacier. 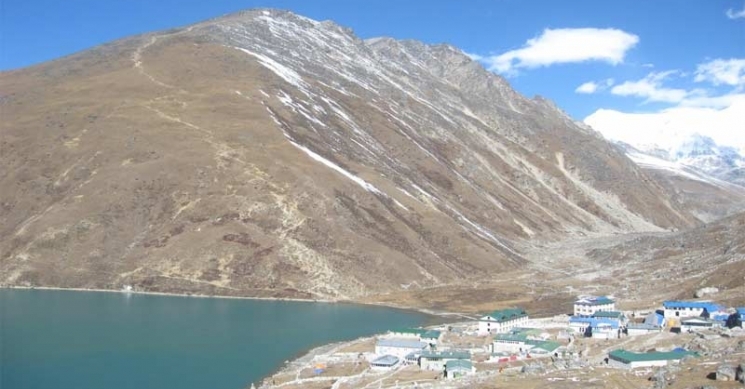 We pass through mesmerizing natural beauty of the turquoise lakes Longpongo and Taboche Tsho and reach a third lake, Dudh Pokhari, where the Gokyo village is situated. With the backdrop of Cho-Oyo, the beautiful and well facilitated village and its outstanding periphery is our shelter after this adventurous day. Day 8 :Rest day at GokyoGokyo is a trade center where the Sherpa people run lodges to provide the best services to trekkers. 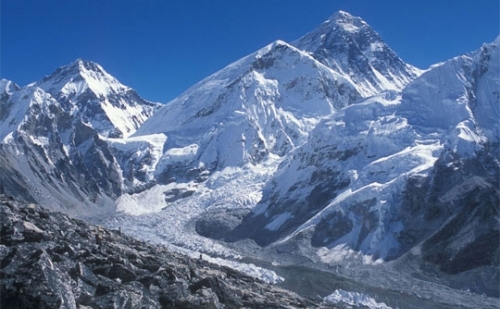 It is situated by the side of Ngozumpa glacier, the biggest glacier of Nepal. This day you can also take a trip to the Fifth Lake via the Fourth Lake. Stay over night in a tea house lodge. Day 9 :Gokyo-Renjola pass- MarlungToday we start to walk to Renjola pass early in the morning. We leave the main trail of Gokyo valley to take Renjola trail by Dudh Pokhari. After 3 hours walk the vista of the Everest, Lhotse, Cholatse and Taboche can be enjoyed. The trail continues down the stairs to reach Angladumba Tsho. On further walking we see Relama Tsho and Renjo Lake then we walk through these narrow valley teemed with giant boulders to Lumde. After an hour walk we reach Marlung, the place where we stay tonight. Day 10 :Marlung-Thame-Namche Bazaar(441m)The next day we follow the traditional route that had been followed for centuries by the tibetean traders which is a descent from Marlung to Thame. Crossing Bhote Koshi, descending to Taranga we reach Langmuche Khola. We can view astonishing view of the mountains such as Thamserku, Katenga, Kusum Kangguru etc from the lodges besides seeing the famous Buddhist shrine (Gompa) at Thame. We cross the bridge reach Samde, the place which offers breathtaking beauty of mountain views. Down the steep path we reach Thamo village where there is a monastery called Khari Goma which is the nunnery.. Finally we reach to Namche through some gompas, prayer flags, chortens and Mani stones. Overnight in Namche. Day 12 :Fly Back to Kathmandu from LuklaThe taking off is a dramatic scene just as the landing. The rest of the day can be used for sightseeing or relaxation. Day 13 :Final Departure or onward for next program Departure from Kathmandu. A drop from the hotel to the airport 3 hours before the scheduled time of flight is arranged in a private tourist vehicle. You can also extend your trip by opting for another program.